saqqara | Could Joseph and Imhotep have been the same person? Joseph was a very prominent person in Egyptian History. By the 18th dynasty, Netjerikhet was known after his vizier as Pharaoh Djoser; the Pharaoh of Joseph (or Zozer in Greek). Joseph saved Egypt from a seven year famine and brought all the land of Egypt for the Pharaoh. He would have been a very prominent person in Egyptian History. The Bible is silent about what Joseph did in the last 66 years of his life but it does say that when he died at the age of 110 years, he was given a Royal Egyptian burial. It is quite likely that Joseph was the Imhotep of the third dynasty, the vizier of Pharaoh Netjerikhet and the designer of the Step Pyramid complex at Saqqara (which was really a grain storage and distribution centre). After saving Egypt from a seven year famine, he continued to serve the Pharaohs of the 3rd and 4th dynasty and was, therefore, in a position to ensure the safety of his family, the Israelites who had settled in the best part of the Land of Ra and were rapidly increasing in number. Joseph-Imhotep was responsible for burying the pharaoh when Netjerikhet died in the 5th year of the famine. Joseph-Imhotep decided to bury Netjerikhet in the first grain silo that he built (it was fraught with ventilation issues making it difficult to use as a grain silo anyway). The grain silo was to make an excellent tomb in which to place Netjerikhet’s sarcophagus. Joseph-Imhotep just had to make a platform at the bottom of the silo and line the silo with ornate limestone and then lower the Sarcophagus into place. There was already a number of access tunnels which could be extended to become the galleries in which Netjeriket’s funerary vessels and treasures were placed. Joseph-Imhotep sealed the tomb with a granite slab and then built a mastaba out of solid limestone on top. Prior to this, mastabas were much smaller structures and made out of mud bricks with a much smaller shaft in which the pharaoh was buried. As time went by, Joseph added more mastabas, made from solid limestone, to that of Netjerikhet’s, to bury his 3 wives and 11 daughters. The mastabas were added initially on the same level but eventually were stacked on top of one another to give rise to a step pyramid structure that was finally faced with smooth limestone. As time went by, Netjerikhet eventually became known after his vizier as Pharaoh Djoser (the Pharaoh of Joseph). The Egyptians and the Greeks tried to deify him (Imhotep). Temples were built in Imhotep’s name and pilgrims in the Ptolemaic period would bring mummified animals to offer to his tomb in the hope of being healed; over a 1000 years after Joseph-Imhotep’s death! Djoser was buried in a shaft that was originally used to store grain. The tunnels were poorly ventilated and workers would have suffocated. The tunnels of the first grain silo were poorly ventilated. Many workers would have collapse from exhaustion. Djoser was entombed in the first silo built by Joseph / Imhotep. The Step Pyramid was built on top of it. The Step Pyramid in Saqqara. Built on top of a shaft that was probably the first grain silo built by Joseph. When Pharaoh Djoser (Netjerikhet) died in the 5th year of the famine, Joseph (Imhotep) made the grain silo into a tomb by encasing it with ornate limestone. Djoser’s sarcophagus was placed on a platform at the bottom of the shaft and then the top of the shaft was sealed with a heavy granite slab. Successive mastabas were built on top of the burial chamber (shaft) resulting in a Stepped Pyramid. A diagram of the shaft and tunnels under the Step Pyramid of Djoser (Netjerikhet) at Saqqara in Egypt. The Step Pyramid was the first pyramid to be constructed and was designed by Imhotep who was the sage / vizier of Pharaoh Djoser. 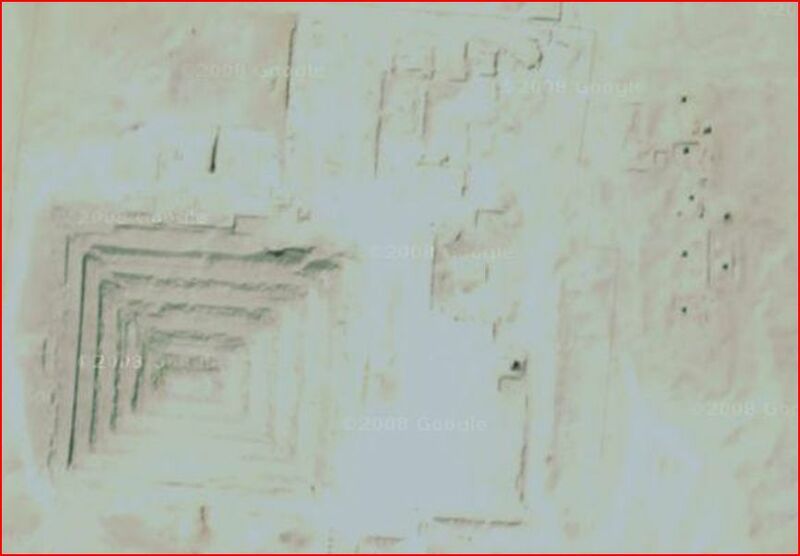 The central shaft has many similarities to other shafts in the Step Pyramid complex. The main entrance leads directly to the central shaft in which Djoser’s sarcophagus was placed when he died. If this shaft had been previously used to store grain, a means of retrieving grain from the bottom of the shaft would have been necessary. Four such tunnels connect to the bottom of the shaft below the level of a platform on which Djoser’s sarcophagus was placed. These tunnels radiate out of the shaft into a series of blind ending galleries where Djoser’s treasures and mortuary vessels would have been placed. They are connected to the main entrance by a pair of tunnels with stairs. Ventilation would have been poor if the shaft had been used as a grain silo prior to converting it into Djoser’s tomb. Other grain silos in the complex have much better ventilation. If this shaft had been previously used to store grain, a means of retrieving grain from the bottom of the shaft would have been necessary. Four such tunnels connect to the bottom of the shaft below the level of a platform on which Djoser’s sarcophagus was placed. Tunnels under the Step Pyramid in the Djoser complex at Saqqara, Egypt. The main entrance leads directly to the shaft and would have offered no challenge to grave robbers. Heiroglyphs of Egyptians retrieving grain from underground silos using an open stairwell. 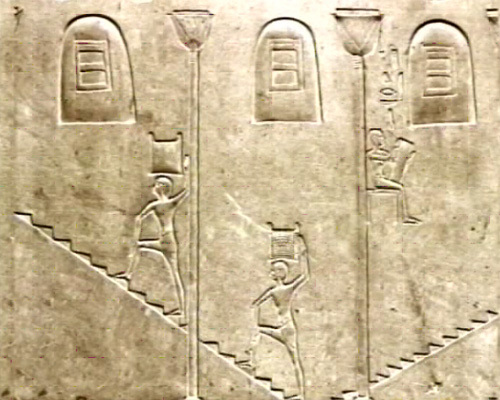 Heiroglyphs of Egyptians retrieving grain using an open stairwell. This was a great improvement on the tunnels of the first grain silo that were poorly ventilated and resulted in workers suffocating. The second generation of grain silos were much more accessible with an open stairway and a ventilation shaft connecting to the tunnels. Wind could blow into the tunnels via the stairwell and come out a ventilation shaft allowing better circulation of air so that the workers did not suffocate. A grain silo in the Step Pyramid complex. Access to the bottom of the silo is from the steps in the pit next to it. An open stairwell leading to tunnels used for retrieving grain from the 11 silos that were connected it. Entrance to the tunnels at the bottom of the stairwell. An open stairwell that would allow better ventilation of the tunnels leading to the grain silos. An open stairwell for retrieving grain from the silos. An open stair well used to retrieve grain from the second generation silos of the Djoser Complex. A ventilation shaft connected to the grain silo tunnels. Grain could also have been pulled up in baskets. A second generation grain silo in the Djoser complex. A grain silo / ventilation tube in the Djoser complex. Retrieving grain was much easier with an open stairwell. A crane for lifting out baskets of grain and lowering items into the tunnels. Stairwell down to the tunnel for retrieving grain from the silos The shape of the stairwell would have directed wind into the tunnels. The new generation of grain silos had an open stairwell providing better ventilation of the underground tunnels. Joseph built silos to store grain in key Egyptian cities. If one was to look for some lasting legacy of Joseph in Egypt that is mentioned in the Bible, it would be grain silos. Similarly if one was to look for a lasting legacy of the Israelites in Egypt, it would have to be mudbricks, and lots of them. These are the two things that the Bible mentions that could have stood the test of time and are unique enough to positively confirm the existence of Joseph and his family in ancient Egypt. Joseph was the first to think of building grain silos in Egypt and so naturally, one would look for the oldest grain silos to be built in Egypt. The tomb of Imhotep adjoining the Ibis Galleries in Saqqara. The coffin was empty and orientated to the north. The tomb dated to the 3rd dynasty. The Ibis galleries dated to the Ptolemaic period when pilgrims brought offerings to Imhotep hoping for healing. The tomb of Imhotep with an empty coffin orientated towards the North. The burial chamber is a pit that is part of a mastaba type tomb. Found within the tomb were jars bearing Djoser’s imprint. On the coffin were titles of Imhotep. The pit connects to the Ibis Galleries which contain thousands of mummified Ibis birds in pots dedicated to Imhotep about 1000 years after his death – dating to the Ptolemaic period – found by Emery in 1964. In 1964, Walter Emery found huge underground galleries containing the mummies of sacred animals that were dedicated to Imhotep, the builder of the Step Pyramid and the high priest of Heliopolis. Emery found an inscription in the Animal Galleries indicating that that Imhotep was buried there. Emery died before Imhotep’s tomb was found. Eventually, a third dynasty tomb was found that had a funerary chamber connected to the Ptolemaic Animal Galleries that Emery had discovered, dedicated to Imhotep. The tomb was connected to the passages of the Ibis Gallery that were filled with thousands of mummified Ibis birds in pots dedicated to Imhotep by pilgrims in the Ptolemaic period some 2000 years after Imhotep lived. The tomb contained pots that had the seal of Djoser on them. This was, no doubt, the tomb of an important figure in the time of Djoser. The complex was dedicated to Imhotep and so one would assume that this was the tomb of Imhotep. A sarcophagus was found that had titles that Imhotep had been given. The sarcophagus in the tomb, however, was empty. Imhotep’s mummy was never found. This is no surprise for people who believe that Joseph and Imhotep were the same person as the Bible records that Joseph was embalmed and buried in a coffin in Egypt but that his bones were removed by the Israelites when they left Egypt and finally buried in the promised land when the Israelites arrived there 40 years after the Exodus. Long after his death, Imhotep became an object of worship. He was deified by the Greeks and the Egyptians. Many temples were erected to worship him. 2000 yrs after his death, pilgrims would come to his tomb hoping to be healed. They would bring offerings of mummified animals in jars (Ibis birds, falcons, hawks, baboons etc). These were stored in underground passage ways called galleries which were within a mile of the Step Pyramid at Saqqara. The search for Imhotep’s mummy and tomb had been revived by the discovery of the base of the statue of Djoser with the name and titles of Imhotep on it by Firth in 1926 and later the discovery of the animal galleries by Emery in 1964. When this tomb was eventually found, people did not like what they found. There were no treasures, there were no writings and there were no inscriptions on the walls by Imhotep. Just a coffin in a mastaba that was orientated to the North indicating that Imhotep did not worship Re. What’s more, the coffin was empty. While it was clearly one of Djoser’s officials, people could not believe it was Imhotep’s tomb. While believers (Christians and Jews) struggle with the fact that the Egyptians worshipped Imhotep who seems to be the high priest of a pagan god, the non believers (Egyptians) struggled with the fact that Imhotep’s sarcophagus and mastaba were orientated to the North indicating that he did not worship Re. It should not surprise us that Joseph, if he was Imhotep, was a priest of Re as the Bible tells us that Joseph married the daughter of the high priest of On (Heliopolis) whose name was Potiphera (or perhaps Ptah as it is known in Egypt). This would explain one of Imhotep’s titles; “son of Ptah”. Archaeologists argued that Joseph could not be Imhotep because Imhotep lived a thousand years before Joseph according to the traditional chronology derived from Manetho. Wanting to find the Imhotep they envisaged, archaeologists brushed aside this discovery and continued to search for Imhotep’s tomb. Since 1964, the search for Imhotep’s tomb and mummy has continued but nothing his been found. Perhaps this is the tomb of Imhotep after all. What better place for pilgrims to come to bring their offerings to Imhotep; even if his mummy was not there. With a better understanding of the Egyptian Chronology, it may be possible to reconcile the differences between the Biblical Chronology and the History of Egypt. The relationship between the dynasties of Egypt and the Phases of Israel. Christians can understand man’s tendency to deify God’s messenger. The Greeks and the Egyptians did not deify Imhotep until 1000 years after his death. This does not alter the facts in Imhotep’s (Joseph’s) time that he was able to save Egypt and the surrounding nations from a famine that lasted seven years and that by selling grain he was able to make the pharaoh rich and buy up all the land of Egypt except that of the priests. He was able to protect his family as they grew to be a nation in Egypt. In his spare time, he built canals, pyramids, buildings with columns, store houses and grain silos. He wrote many literary works including medical writings. He developed mummification techniques. He was embalmed when he died and was buried in a tomb close to the Step Pyramid. When the Exodus of the Israelites took place, his mummy was removed from the tomb and carried by the Israelites to the Promised Land where he was finally put to rest. In later times, Imhotep became an object of worship and was deified by the Egyptians and the Greeks who built temples to honor him and brought mummified animals to offer to his empty tomb. Today, most Egyptians are either Muslim or Christian and there are not many worshipers of Re. The Pharaoh and the Egyptians recognized Joseph / Imhotep as a great ‘seer’ and Joseph was able to help save Egypt. In so doing, Joseph / Imhotep became quite an influential figure in Egypt. With his influence, he was able to ensure the safety of his family. God used Joseph to save His chosen people, the Israelites. Joseph may have tried to steer the Egyptians towards Jehovah, but his main objective was to save his family and allow them to grow into a Nation. It may well have been Joseph / Imhotep who introduced circumcision to Egypt. Imhotep / Joseph’s children, Ephraim and Manasseh, were born before the famine and lived with the Israelites. Legend has it that Imhotep / Joseph’s wife, Asenath, died in child birth . Ephraim and Manesseh’s descendants became two of the largest of the twelve tribes of Israel. Imhotep / Joseph’s descendants left Egypt with the Israelites when the Exodus took place 430 years after Imhotep / Joseph first came to Egypt. At the end of his life, Joseph / Imhotep wanted his bones to be carried back to the promised land to be buried with his fore fathers. He was clearly loyal to the God of Abraham. Both Christianity and Islam (as well as Judaism) are Abrahamic religions that believe the Old Testament is true. Identifying the correct historical counter parts of Abraham, Joseph and Moses would not only help to affirm these religions for those who doubt, it would give added meaning and significance to ancient history which has been lost or distorted as a result of wars and natural disasters or white washing over the ages. Genesis 41:45 Pharaoh gave Joseph the name Zaphenath-Paneah and gave him Asenath daughter of Potiphera, priest of On, to be his wife. And Joseph went throughout the land of Egypt. Genesis 41:50 Before the years of famine came, two sons were born to Joseph by Asenath daughter of Potiphera, priest of On. Genesis 46:20 In Egypt, Manasseh and Ephraim were born to Joseph by Asenath daughter of Potiphera, priest of On. Genesis 50:26 So Joseph died at the age of a hundred and ten. And after they embalmed him, he was placed in a coffin in Egypt. Joshua 24:32 And Joseph’s bones, which the Israelites had brought up from Egypt, were buried at Shechem in the tract of land that Jacob bought for a hundred pieces of silver from the sons of Hamor, the father of Shechem. This became the inheritance of Joseph’s descendants. Hebrews 11:22 By faith Joseph, when his end was near, spoke about the exodus of the Israelites from Egypt and gave instructions concerning the burial of his bones. forward video to 29min 10 seconds to see the entrance of the Step Pyramid complex. The columns had the shape of a corn cob. forward video to 33min 10 seconds to see the Grain storage system designed by Imhotep / Joseph. The tomb of Imhotep was connected to the Ibis Gallery. The tomb contained a coffin / Sarcophagus that was empty. It was empty because the Israelites took Joseph / Imhotep’s bones with them when they left Egypt at the time of the Exodus. This was Joseph’s (Imhotep’s) wishes before he died. It was a mastaba type tomb with a burial pit that connected to the animal gallery containing thousands of mummified Ibis birds, falcons and baboons; even bulls. The Mastaba was orientated to the North indicating that Imhotep did not worship Re. The sarcophagus had many titles on it that could have applied to Imhotep or Joseph. Pots with the imprint of Zozer were also found in the tomb. 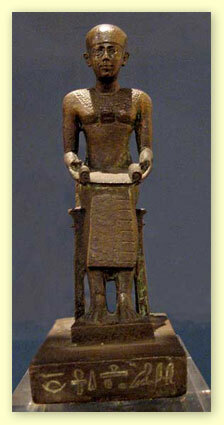 Over a thousand years after his death, Imhotep was deified by the Greeks and the Egyptians. The pit containing Imhotep’s empty sarcophagus was connected to the Ibis Gallery containing thousands of jars with mummified Ibis birds that were dedicated to Imhotep by pilgrims who visited his tomb in the Ptolemaic period; over a thousand years after his death. People came to the tomb hoping to be healed.